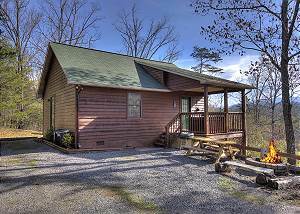 I Love view is rustic destination with exquisite furnishings, bonfire pit access, & amazing views on a private mountainous location not far from... VIEW NOW. Considering the history of Pigeon Forge, it's highly appropriate that one of the first businesses in this East Tennessee town was a furnace and iron forge. Appropriate because of the burning desire of hardworking visionaries who forged a town from what once was wilderness. When the pieces of the Pigeon Forge history puzzle are put together, the picture is one of a highly successful business community that city patriots could never have imagined. The land that is now Pigeon Forge and the surrounding area once was used as hunting grounds by the Cherokee and other eastern tribes of American Indians. A treaty signed in the late 1700s opened the fertile valley for settlement. In 1820, Isaac Love established a furnace and iron forge, the community's first business. The name Pigeon Forge is a combination of the iron works and the Little Pigeon River that flows through the town. In the 1700s and early 1800s the river's banks were lined with beech trees. Beechnuts were a mainstay in the diet of Passenger Pigeons, which made the river a natural stopping point for huge flocks of the now-extinct species. As late as 1907, population records show Pigeon Forge with a mere 154 residents. However, the lure of the Smoky Mountains proved to be a siren's song. By the 1930s, visitors began to trickle into town, even though the only places one could stay as guests were private homes. The iron forge was still in operation and farming was the area's primary business. In1946, a landmark sale of the first parcel of property smaller than a farm was negotiated. It was during that time that the main road through town, which ran along the river, became the hub of the community, complete with two general stores and two churches. As growing pains set in, the town voted for incorporation in 1961. In the early 1980s, with a firmly established city government and a new Department of Tourism, Pigeon Forge began to make its voice heard in an expanding tourism market. New business, primarily related to tourism, was recruited to the area. Newly created jobs brought an increase in the permanent population. As of June 1997, the most recent census indicated 3,975 permanent residents within the Pigeon Forge city limits. A little more than a quarter of a century ago, Pigeon Forge was a small, peaceful community where cornfields were interrupted only by the occasional business venture and two traffic lights along Highway 441. That once two-lane, black-topped highway is now six lanes wide and known as the Parkway. A major turning point in the city's quest for a flourishing tourism industry occurred in 1986 when Dolly Parton applied her name, energy and talents to Dollywood, a theme park on the sits of the former Silver Dollar City. The facility was an immediate hit with visitors and continues to expand annually with an eye to entertainment for all ages. Fast food to family style to upscale dining are included in the mix of restaurants in Pigeon Forge. Locally owned and operated restaurants, regional chains and themed restaurants make up the choices available to hungry travelers. Entertainment is a mushrooming industry in Pigeon Forge. A dozen theaters offer a variety of performances, all delivering family-style entertainment. Complementing the entertainment of the theaters are more than 50 family attractions, more than 200 stores in the city's six outlet malls and more than 140 craft, gift and specialty shops. Just as Pigeon Forge today stands proudly on its legendary history, it also looks forward to the unfolding of its future as a lively, constantly growing tourism mecca for as long as the Smokies entice visitors to the natural beauty found in their peaks and valleys. Gatlinburg is two miles long by five miles wide. On its own, just a sleepy little mountain town with mostly good neighbors. A couple of the family names go all the way back to before the 1800's. Then there's a handful more families that can trace back to the White Oak Flats days of 1835. The story goes that Radford Gatlin opened a general store in the 1850's and agreed to handle the new mail service, so the postmark soon became Gatlinburg. Unless you can trace your name back to the mid 1800's, you're not really from here, you're just a' visitin'. In the 1930's along came the Great Smoky Mountains National Park …. big name, big park. Quite a few families had to move so the park could be built. The everyday people began buying up the 800 square miles of land to give to the government so soon it was obvious to everyone that something big was about to happen. Big, indeed! Now boasting 10 million visitors a year, Great Smoky Mountains National Park has transformed Gatlinburg from a sleepy little town of 70 years ago into the perennial "Mountain Getaway" choice of Southern Living magazine readers and number one Mountain Destination designation by AAA magazine readers in 2003. Arts and crafts have long held a deep association with the Southern Appalachian Mountains. Nowhere else in the South will you find a richer heritage of fine craftsmanship than Gatlinburg. The Great Smoky Arts and Crafts Community, established in 1937, is the largest group of independent artisans in North America. Located on an eight-mile loop at the north end of Gatlinburg, the Community proudly preserves the craft heritage of the Great Smoky Mountains year-round. This area offers you the best in a wide range of craft shops, including pottery, woodcarving, candlemaking, quilting, weaving, broommaking, and painting, among many other fine art forms. Gatlinburg in just one trip. Plan on coming back! If you love to shop, Gatlinburg is your kind of place! With more than 450 specialty shops, boutiques and galleries, you can easily find a special collectible or unique one-of-a-kind piece in this mountain resort. And dozens of dining choices from national chain to family-owned provide menus featuring pancakes to prime rib, and everything in between. The Great Smoky Mountains - named for the smoke like blue-mist haze that surrounds them, is the picturesque backdrop of Pigeon Forge, Tennessee. Discover 500 thousand acres of Southern Appalachian wilderness on one of the oldest uplands on earth! The Smoky Mountains are 95 percent forest - home to diverse wildlife, breathtaking streams, waterfalls and flowering plants. It's no wonder millions flock to this natural wonder every year! Great Smoky Mountains National Park straddles the crest of the Smoky Mountains, providing a unique experience for visitors. Entrance to the park is free and it's open year round. Smoky Mountains National Park provides 800 miles of trails for hiking and exploration. There are plenty of sightseeing and photo opportunities along the scenic routes. If you like to "rough it," you'll enjoy our selection of campgrounds, right in the heart of the Smoky Mountains foothills. Sizeable picnic areas are great spots for eating and gatherings. From fishing to horseback riding, revel in the beauty of our ancient mountains and have a ball Smoky Mountains style!